The latest (and possibly greatest?) edition of the geek/comedy fusion series Nerdgasm took place on a rainy Saturday night in Toronto last weekend, with humans and Stormtroopers alike piling into the Underground Cinema for a one-show-only performance by Brian Posehn. 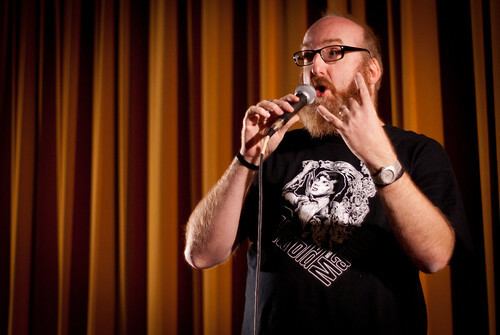 Delivering a mix of material from his latest CD Fart and Wiener Jokes, and some new treats that could very well cause his daughter physical harm (you had to be there), Posehn’s set flew by. In fact, I challenged one of the producers after because I was unconvinced that he did a full hour (he did). You know what they say about having fun. For future offerings of comedy geekery, hit up nerdgasmcomedy.com.